Part of me wants to moan like mad about this incessant summer rain but another part of me – the part designing & installing the garden here at Moregeous Mansions – is kind of relieved not to have to keep watering all the new plants to keep them happy and get them settled in their freshly dug homes. All of my new planting has pollination in mind, and the plight of Britain’s bees especially. As far as I’m concerned, every little bit of help is important and with my home being in a city, I figured the more bee-friendly flowers I could squeeze in, the better! The long, dilapidated garden wall between us and next door is now re-built (you can see the process here), with new foundations cemented, the gorgeous fence panels painted & fitted, and a 10m trench of thoroughly and densely compacted roots dug up, soil sifted and lovingly backfilled. There you go, how to fit three weeks hard graft into one sentence! 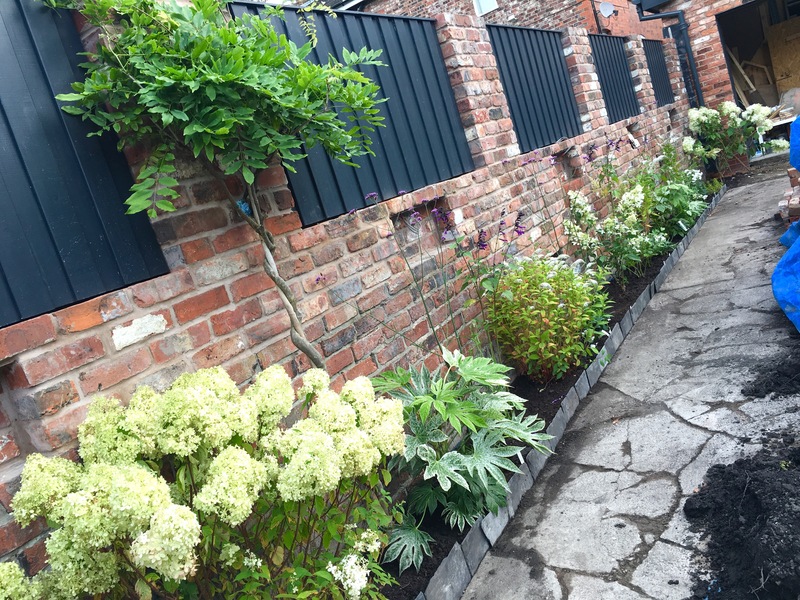 Not all just me either, massive thanks to Hurricane Helen for helping so much with the digging and to Joan Collins aka Brian for stupendous wall building skills x Now all I had to do was #makeitmoregeous and create a Bee Wall! 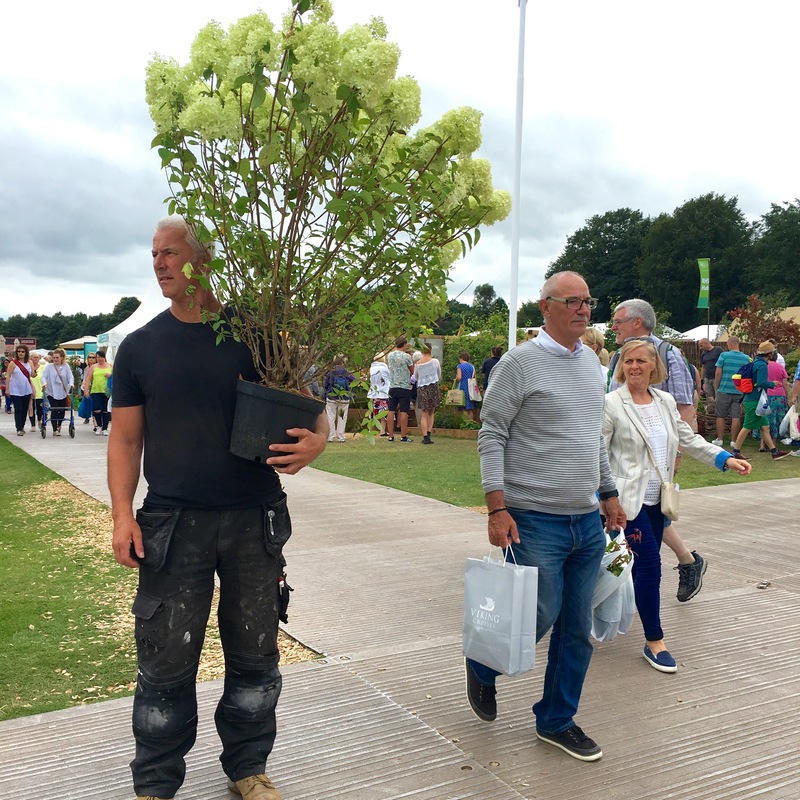 A day out at RHS Tatton was just the ticket to source some wonderfully buzz focused delights, though when he saw the size of some of them Mr M did wonder if we’d get them all in the car. Especially when I rounded off the haul with 20 lavenders at £2 each, a bargain definitely not to be missed. Stunning hydrangeas were everywhere at Tatton, quite the flower of 2016 and easily knocked the ever-popular allium into second place for swoonworthiness. I bought a Phantom, a Limelight and another Hydrangea Paniculata which I didn’t get the name of – all beautiful and full of flowers. I think he’d lost me at this point…. I love the lady on the right looking with well jels at my Limelight 😉 Along with some lofty purple verbena, whites in the form of scabiosa alba, penstemon, lysimachia clethoides & double diamond agapanthus, and spiders web for greenery, I was literally surrounded by bees as soon as we lined them up at home for planting. I bordered the front of the trench with left over slates from the roof to provide a barrier between it and the soon to be laid driveway. And I also put visqueen at the rear of the trench to stop the base of the wall getting soaked, that’s a good tip for raised beds too. The fill is a mix of ultimate blend compost which I get ready delivered in a tonne bag and the soil dug out originally then sieved for stones and roots. It was awful quality and no good for planting, but if you sieve all the original soil and just use that it can be very heavy, as all the bits which aid drainage are gone. Adding in a good quality compost gives the humeric substances which aid soil fertility and in my experience stops the soil becoming too claggy. Seriously, if anything dies in this I’ll be amazed, there’s so much care poured into it!